02 Jan Garden Design Advice for Landscapers: Can design win business? One of our core services is providing garden design advice for landscapers. A beautifully presented concept design can help win business and save money. This article explains more. 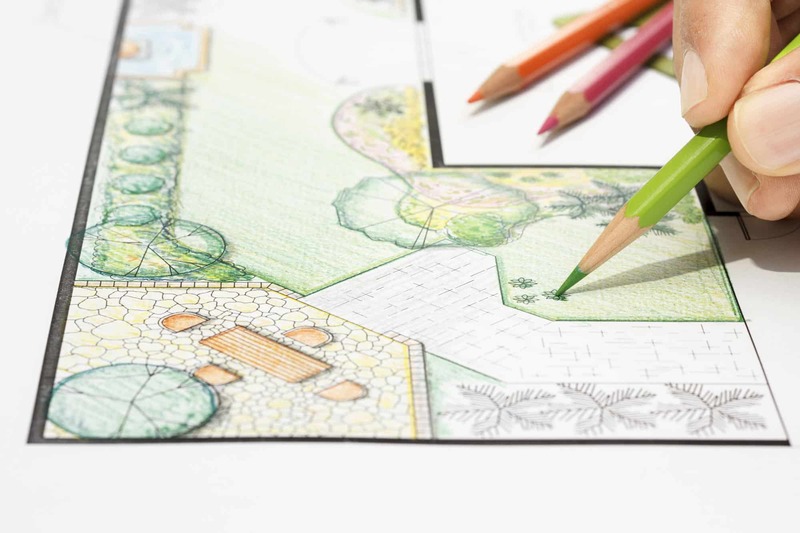 Have you ever been asked to build a client’s garden with only the barest design brief? How difficult was it to provide a quotation only to find that the client changed their mind several times during the build? Did that impact on your profit margin? I’m sure it did. In my early days of working as a Landscaper, that happened to me a lot. As an active member of the Association of Professional Landscapers (APL) I know it happens to other landscapers too. That’s what ultimately led me to found Tapestry Garden Designs. I wanted to support colleagues in the industry with cost effective garden design advice for landscapers and builders. 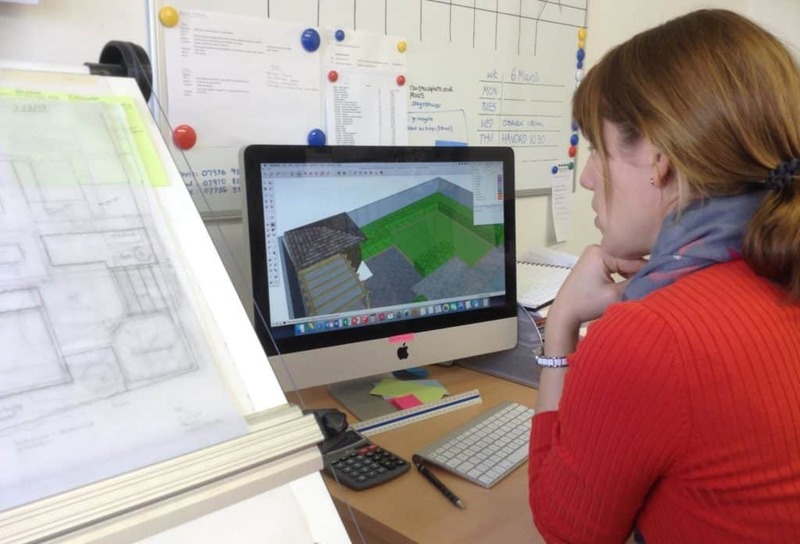 Why work with a garden designer? Most of the landscapers I know have got a pretty good eye for design. They can see what features will fit best with the lie of the land and they know from experience what work is involved and what the costs are likely to be. Clients on the other hand rarely have the same insight or understanding. Quite often, they don’t really know what they want and are waiting for you to inspire them. Describing your ideas to a prospective client can be challenging. There’s no guarantee that they are interpreting your description the way you mean them to. With a professionally drawn concept plan you can be sure that your client is literally reading off the same page as you are. When you and your client are both thinking the same will be fewer incidences of “can you just move this or change that?” The job is less likely to run over time, your costs are more manageable and everyone is happy. A new garden is a big investment for most people. Just as they do when buying a car or building an extension, they do a lot of research before committing to a supplier. That means that you will most likely be competing with other landscapers. Price isn’t the only consideration when buying a new garden. Appearance and functionality are vital of course. But what also matters a lot is trust. Would you let a stranger tramp about on your property when you’re not there? No? me neither. I need to like be sure that any contractor is trustworthy, honest and reliable. An important part of marketing your business is presentation. Are you appropriately dressed? Is your vehicle clean and sign written? Do you have a professional looking brochure or website and do you present prospects with good quality sales materials? Now think. Would your client be most likely to trust a hastily drawn layout scribbled on the back of a pizza box or would she be more comfortable with a beautifully drawn concept plan? Everyone is better at some things than others. In this industry I have met all sorts. There are brilliant hard landscapers who don’t enjoy planting. Many horticulturists would rather leave fencing and decking to someone else. Whilst most lighting wizards who find turfing really dull. I find that people work best and most cost effectively on the tasks that are most suited to them. Look at me for example. I’m perfectly capable of updating my own website but it takes me ages. What would take my webmaster 20 minutes would take me an hour and a half. Much better to pay him for 20 minutes of his time while I spend that hour and a half earning money on site. By the same token you could spend several hours drawing a design to impress a prospective client – and still not being 100% happy with the presentation – when in fact you could have been negotiating better terms with a supplier – or whatever it is you’re good at. First and foremost, let’s be clear. Tapestry Garden Design Studio does exactly what it says in the name. We can offer landscaping services if that’s what our domestic clients are looking but we’re not in the business of competing with our trade clients. So you’re safe with us. Our garden design advice for landscapers is based entirely on the information you give us. You tell us about proportions and measurements, aspect, existing features and client requirements. We don’t need to visit the site. We don’t even need to know where it is! To make it easy for you, we send you a list of the information we need from you. We use the data you give us to create a beautiful, high quality concept design. If you prefer it, we can leave our contact details off so that your clients won’t know you’ve had help. 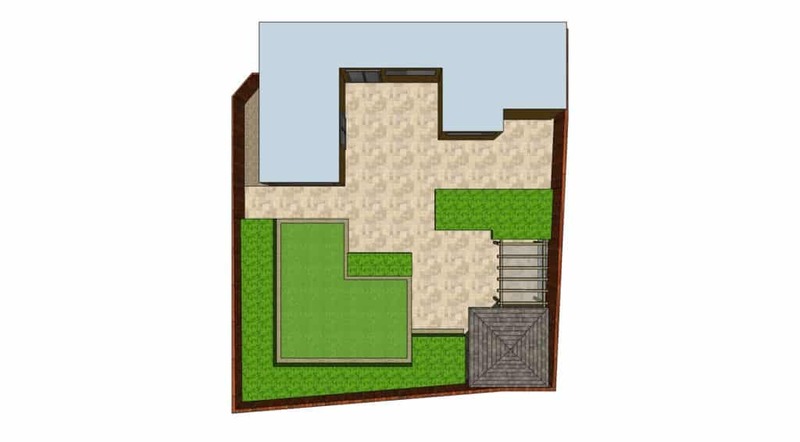 A concept design is a 2D image, in colour, showing the layout of a new garden. It helps your client to picture their new garden and gives them an opportunity to make changes before work begins. You can add measurements to the design and use it when pricing up and quoting. 3D images can be created for an additional fee. See the images above to see how these 3D images bring a design to life. 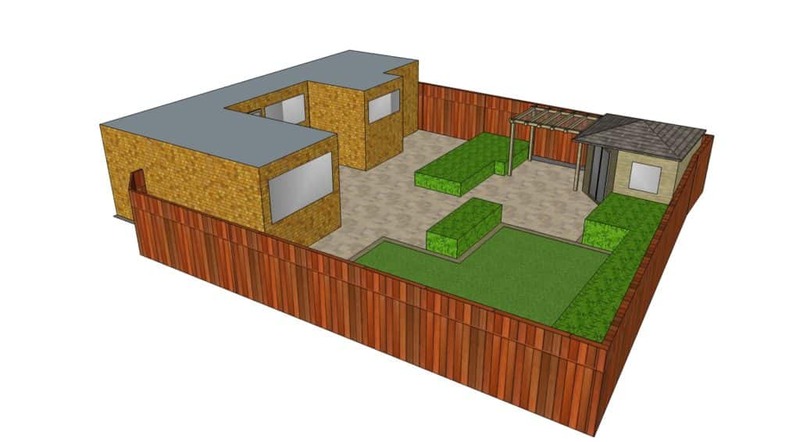 A typical concept design created as part of our garden design advice for landscapers service. Our customer supplied a site survey along with his client’s wishlist. The client had asked for a child-friendly garden with seating and eating area and plenty of visual interest. Our design has included a summerhouse which would provide all year use for the garden. A lawn area for relaxation and play and practical features such as a lawn edging to reduce the need for trimming. Each area is labelled to help the client imagine how the garden might look and function once it’s finished. A concept design doesn’t usually specify materials, colour schemes or plants. It’s for you and your client to personalise the garden and bring it to life. However, if you need suggestions, we’re happy to help. How many hours does it take you to create a beautifully presented concept design? Multiply that number by your hourly rate and you’ll have an idea of what it costs you to do it yourself. Now calculate what you could have earned in that time if you were working on site. Next, contact the team at Tapestry Design Studios and ask for a quote. I strongly suspect that you’ll find that outsourcing garden design to trained experts is actually quite cost effective. Tapestry Design Studios is an award winning garden design team helping to create beautiful outdoor spaces countrywide. We work with landscapers to find ways of turning the most uninspiring gardens into attractive, practical and manageable places. Our speciality is in designing gardens that meet all of their owners needs at the same time as adding value to property. Our lead designer is Katie Moyes. Katie holds a first-class Diploma in Garden Design from the School of Design at Writtle College. 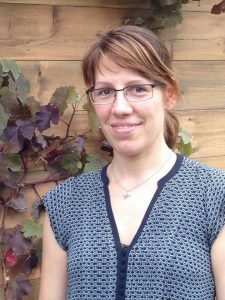 She has completed the RHS diploma and has worked at Beth Chatto’s celebrated garden in Essex. SGD Membership helps keep her up to date with new innovations and industry trends. This talented lady has helped a great many landscapers and gardeners to win work and delight clients with beautifully presented concept plans that translate into stunning gardens.